Air pollutants, especially due to vehicle usage, represent a major health challenge. Pollutants’ emission level is strongly linked to driving behaviour, whatever the vehicle and its technologies. A better knowledge and monitoring of vehicle usage will positively impact the decrease of emissions through improved driving behaviour and habits and foster the development of future standards and infrastructures. 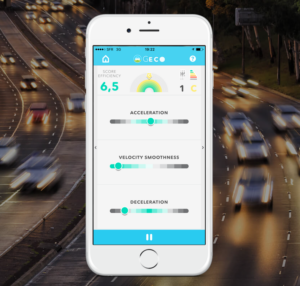 Innovation: To address a growing demand from society for more environmentally-friendly vehicles, EARTO member IFPEN developed an app, GECO Air, which measures how efficiently drivers perform. By coaching the driver in real time, GECO Air has demonstrated pollutant emissions decrease of up to 60%. GECO Air’s web service tool can also be used for prospective studies as its modelling is more relevant than a statistical approach. Impact Expected: IFPEN has first launched the eco-driving GECO app in 2014. 18.000 users have travelled on 500.000 km and 50 companies in the French Auvergne-Rhône-Alpes region have been involved. The same success is expected with GECO Air that will be launched in Autumn 2016. Challenges will also be organised to boost the deployment of the application, at the scales of companies, cities or more widely. IFP Energies Nouvelles is a French major research and training player in the fields of energy, transport and the environment.